The management of extravasation injury in neonates. 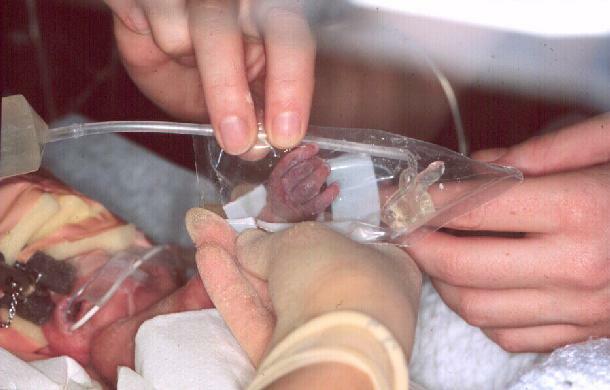 This article describes a technique for the treatment of extravasation injuries in neonates, in which the affected area is covered with a sterile amorphous hydrogel enclosed in an impermeable plastic bag or sleeve. The authors discuss potential advantages of this technique over alternative methods for treating such injuries, by reference to selected case histories. Patients of all ages may be affected, but a retrospective review of 31 cases over a nine-year period showed that they occurred primarily in children and older people , with 57 per cent of all injuries occurring on the hand or dorsum of the foot. 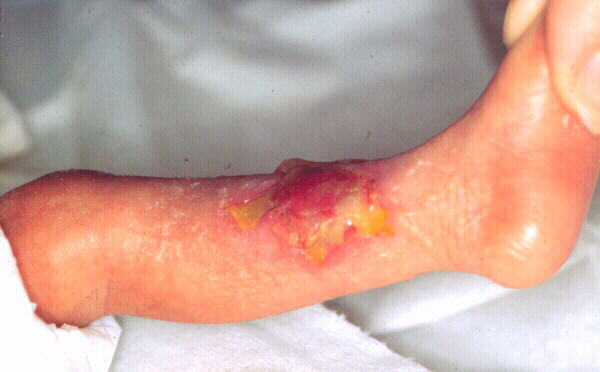 Most of the resulting lesions produced severe scarring and loss of function, many required surgical intervention and in a number of cases amputation was necessary. Of the 33 cases, nine developed severe scarring requiring plastic surgery, or contractures severe enough to interfere with function. 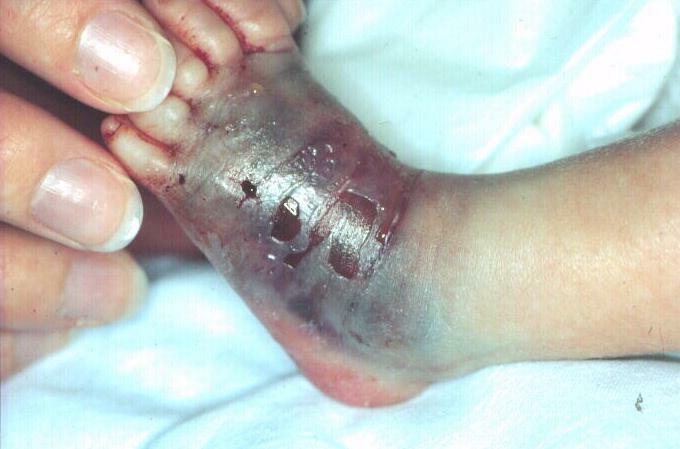 In all nine infants, the injury occurred on the lower leg of dorsum of the foot. A massage technique which is claimed to reduce scarring and the need for grafting has been described by Davidson et al.,  It is claimed that this technique frees the epithelial margin from the central coagulum present in the wound, overcoming the contracting effects of myofibroblasts present in the granulation tissue. In this technique the necrotic tissue and, presumably the wound itself are allowed to dry out and demarcate, an approach which is not in accord with the current philosophy of moist wound healing. 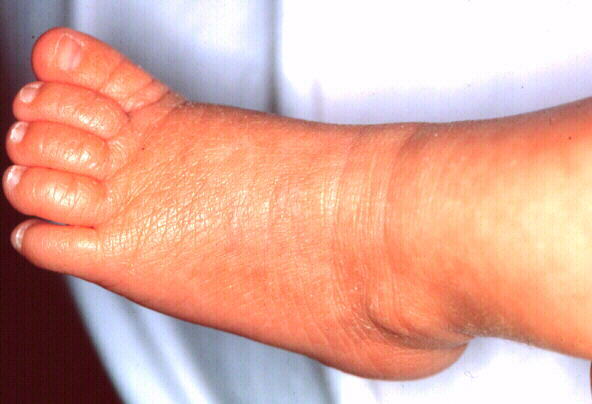 The current treatment was developed specifically for treating extravasation injuries in the hands or feet of small infants but it can easily be adapted for treating similar injuries in patients of all ages. 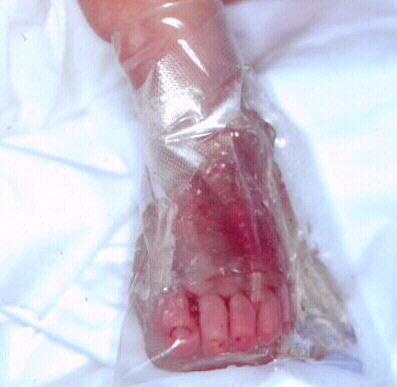 The technique involves the use of a sterile amorphous hydrogel applied to the affected area in a sterile polythene bag forming a "glove" or "boot". The latter can be conveniently produced from a sterile disposable examination glove using a domestic heat sealer of the type used for packaging food prior to storage in a deep freeze. If such equipment is not available, sterile urine collection bags may be used. These are widely available in special care baby units, although they tend to be made from less conformable plastic than that used in examination gloves. The treatment may be started as soon as extravasation is detected or suspected, but should not preclude the use of other more immediate or specific measures such as removal of the extravasated drug by needle aspiration if there are more obvious signs of fluid swelling. If tissue damage is apparent, treatment should be started immediately. The technique is simple to perform. 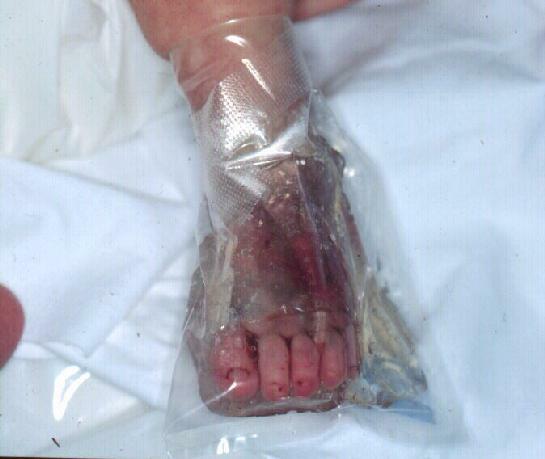 Gel is applied liberally to the injury and the affected limb is placed inside the plastic bag. If required, additional gel may be delivered into the bag with a syringe and a quill using a sufficient to ensure that the wound remains covered at all times and that the bag does not come into contact with the wound surface. 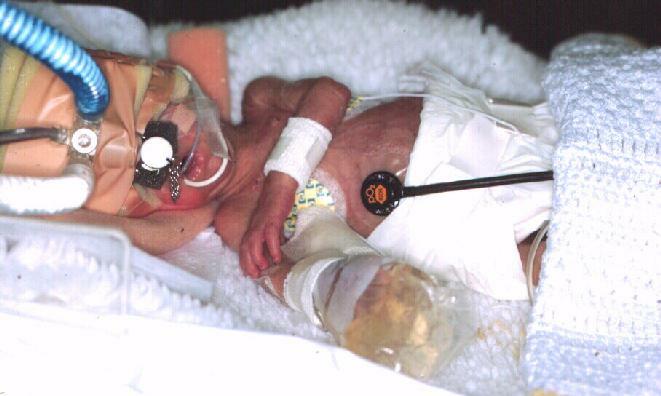 The neck of the bag is closed using surgical tape ensuring that the tape does not come into contact with the baby's skin. If necessary a splint may be applied to the affected limb to support the weight of the gel. As both the gel and the bag are transparent, the wound may be examined without disturbing the dressing, which can usually be left in place for two to three days. If the wound shows any clinical evidence of infection the dressing should be replaced daily and appropriate antibiotic therapy initiated. Dressings changes are accomplished by gently sliding the bag off the limb and irrigating the wound with sterile isotonic saline. During this treatment it should not be necessary to touch the surface of the wound which does not need to be dried before the dressing is replaced. During healing, a pale-yellow semi-solid fibrinous layer may develop on the wound surface. This layer does not appear to effect the healing process and need not be removed. 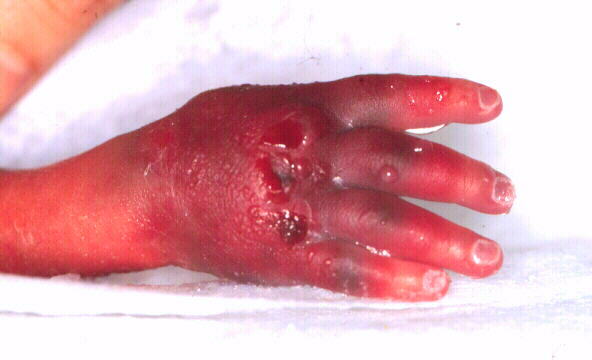 Figure 10 shows an injury resulting from extravasation which occurred during a blood transfusion. 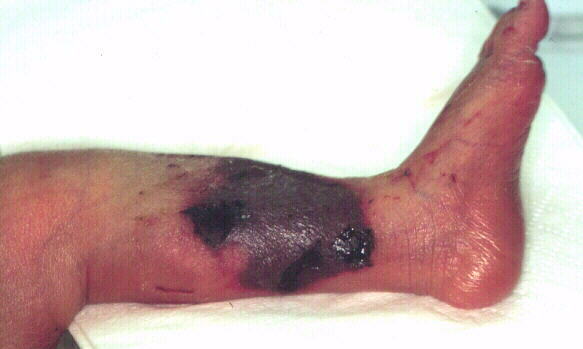 An area of full thickness skin loss can be seen, surrounded by massive bruising. The wound was dressed as described and the dressing changed every three days. The healed wound, photographed four weeks later, is shown in Figure 13. The gel that was used during the original study was Scherisorb - Smith & Nephew Medical Ltd. This contained 2% of a starch co-polymer, 80% water and 20% propylene glycol as a humectant and preservative. This particular formulation is no longer available, but it is likely that many of the new amorphous hydrogels such as Intrasite - Smith and Nephew Medical, Granugel - Convatec Ltd and Sterigel - Seton Healthcare that have since appeared on the market will be equally as effective. Amorphous hydrogels are used extensively for the treatment of sloughy or necrotic lesions where they are believed to facilitate autodebridement of the wound by rehydrating slough and enabling autolysis to take place at an enhanced rate. In the current application, the gel also prevents dehydration of damaged tissue and limits further devitalisation of exposed dermis. These properties are particularly important in view of the high room and incubator temperatures which are required in a special care baby unit. It is interesting to speculate whether in an uncovered wound the production and subsequent contraction of myofibroblasts is initiated or enhanced by the partial dehydration of the granulation bed as a result of the loss of water vapour from the exposed tissue. When used in the manner described, the gel would prevent this water loss, inhibit contraction and maintain the viability of the wound and surrounding tissue. It facilitates granulation and re-epithelialisation leading to decreased scarring, preventing loss of function and results in a healed wound with an acceptable cosmetic appearance. The dressing is easy to apply and remove without causing trauma or discomfort. The wound remains visible at all times. The gel provides a sterile environment for the wound and may help to prevent infection. The technique as described is particularly useful in treating the most common sites of extravasation injuries but it can also be easily adapted to be used on less common sites. This article contains information that was originally published in a paper in the Pharmaceutical Journal. This information is reproduced here by kind permission of the editor. 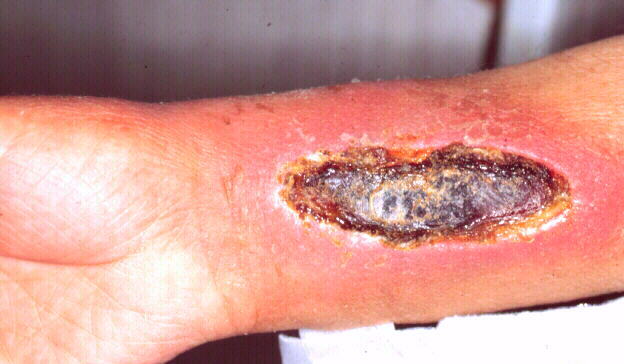 Heckler F.R., McCraw J.B., Calcium-related cutaneous necrosis. Surgical Forum, 1976, 27,62; 553-555. Upton J., Mulliken J.B., Murray J.E., Major intravenous extravasation injuries. American Journal of Surgery, 1979, 137,4; 497-506. 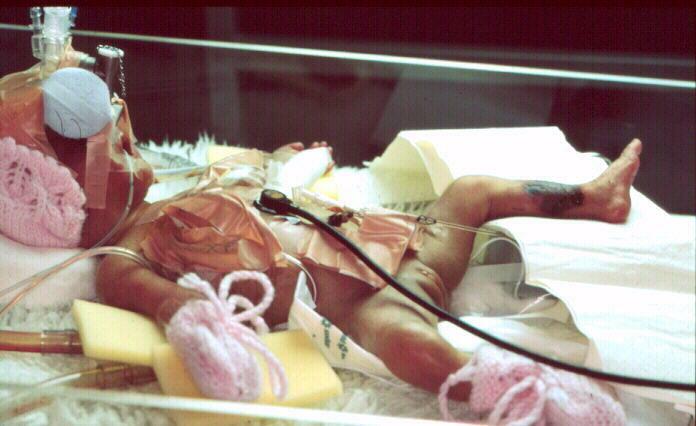 Young T., Wound Healing in Neonates, Journal of Wound Care, 1995, 4(6), 285-288. Wales J.K.H., Hal M.A., Walton P., British Journal of Parental Therapy, 1985, 6, 8. Smith R., British Journal of Parental Therapy, 1985, 6, 114. Davidson D.C., Gilbert J., Severe extravasation injury British Medical Journal, 1985, 291, 6489; 217. Turner T.D., Ed., Wound Care Heinemann Medical Books, 1985, 58. Thomas S., Hay N.P., The antimicrobial properties of two metronidazole medicated dressings used to treat maloderous wounds, The Pharmaceutical Journal, 1991, 246, 264-266.